In the 1950s, Venezuela was seen on the world stage as having the fourth highest GDP per capita and held a coveted position as one of Latin America’s strongest economy, abundant in natural resources, despite its frequent and problematic political instability. By 2007 the economy was a major contender in the oil industry, with oil profits being in the triple digits per barrel and poverty was on the decline. Fast forward to 2016, what went wrong? With the falling prices of oil and the country’s sole dependency on it as its only resource, together with mass levels of corruption within the government, the country was hurled into a downward spiral causing hyperinflation and rising poverty. Venezuela houses one of the largest oil reserves in world, yet despite this, its citizens are suffering from one of the worst economic crisis in its history. With an economy strapped for cash, poverty was an inevitable result, as ordinary people are regularly without food. Angry and hungry mobs continually ransacked supermarkets in hopes of something to eat. Store shelves remains empty as food is astronomically expensive or scarce. 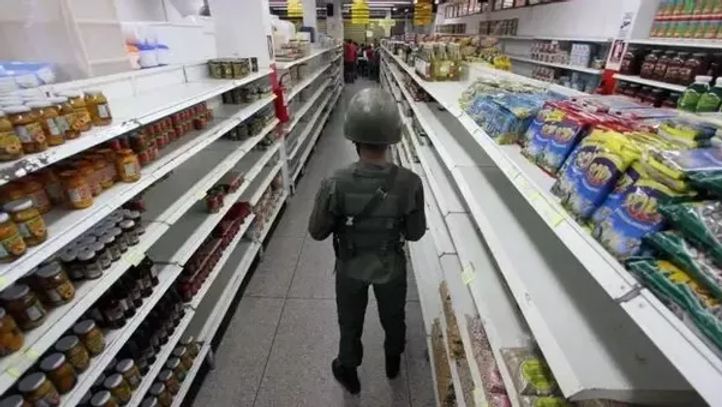 Though a state of emergency was declared by the Government, basic food such as milk, rice and oil were rationed and under the protection of armed guards. Citizens were assigned specific days for collection for basic staples, sometimes waiting overnight in long queues. Hunger, a word that we often take for granted, is killing the nations’ little ones from acute malnutrition. Malnutrition causes a range of pathologies in the human body, ranging from death, aliments and other infections. Medical institutions remain short staffed and lack the necessary supplies like medicine, antibiotics, aspirins, gauze and even soap and work with subpar equipment. Hospitals have become overburdened, not with the aged or elderly, but with babies and toddlers, all suffering and emaciated (excessively thin) from malnutrition (as reported by The New York Times, Meridith Kohut and Nicholas Casey, Dec. 17, 2017). How many of this younger generation will continue to die from malnutrition? Poverty has serious and long reaching repercussions, as children raised in poverty are prone to suffer more from frequent and persistent health problems, when compared to those in a more secure financial environment. Infants born into extreme poverty suffer from low birth weights and are often sickly and in most scenarios are likely die before their first birthday. Those that survive are at a disadvantage, as they are more prone to illness resulting in missed school days, impaired vision and hearing, anemia and even have higher concentration levels of lead in the body, which can impair brain functions. In the long term, while oil guarantees a certain measure of stability, the Venezuela economy needs to redirect its future policy to include sustainable development geared towards privately owned farms and agriculture-based industries, all of which can help stimulate the food market and increasing much needed jobs in an already impoverished country. Agri-business has potential, yet despite its significance, it remains mostly unrealised. With future insight and planning, the existing food shortages and rampant poverty that currently plagues the country would probably be unlikely to occur on such a drastic scale and would not have such a devastating effect on the children’s future and unborn generations to come. Thanks Elton Juicy. I do admit we are lagging behind on updating the site and keeping the blogs current. We are involved in a lot of planning activities which is the reason why we don’t get to put as much time in the blogging section of our website. I have made note of your recommendation, and we will look to explore the miftolo tools.